Maximus was a Roman usurper in Hispania between 409 and 411 AD. He had been elected by general Gerontius, who might have been his father. Maximus managed some degree of rule over the provinces of Hispania, and struck coins at the mint at Barcino. 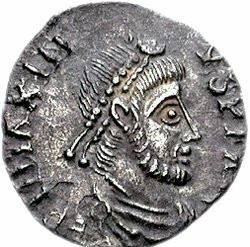 In the first 18 months of his reign Gerontius's forces defeated Constantine III's forces, killed his son Constans at Vienna, and trapped Constantine himself inside Arelas. Seeingthis, Honorius sent his general Constantius into Gaul and Gerontius' soldiers deserted him for the imperial general. Gerontius retired to Hispania, and committed suicide. Deprived of his major supporter, Maximus reportedly fled to sanctuary "amongst the barbarians in Hispania."